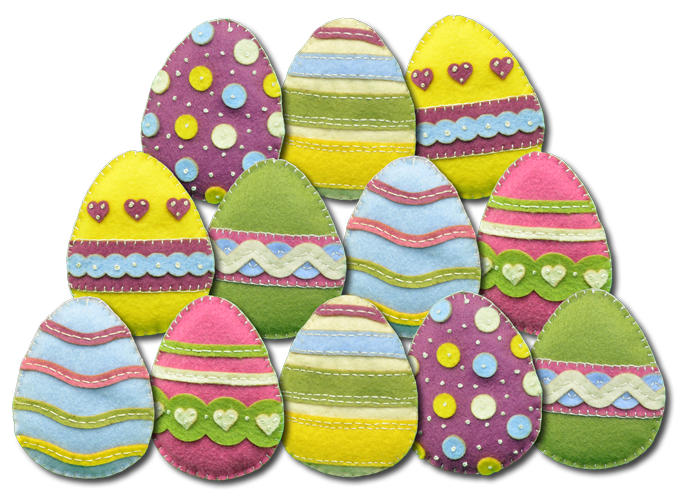 This kit makes one dozen stuffed Easter eggs that are 3″ wide and 33⁄4″ tall. 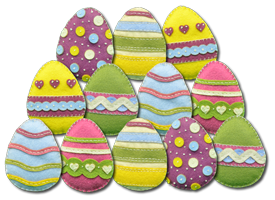 These are really cute eggs that can be used on a table display, hung on a branch or tree to make an egg tree, hung in a window, or use your imagination. They make great gifts for a special friend. This kit also makes a great group project. Why not invite some friends over, make a nice pot of tea or coffee, and put the kit together. With 12 eggs you could invite a lot of friends or have each friend make more than one. All of the eggs, trim and stuffing is pre-cut. The kit contains the wool felt, stuffing, floss, and needle. We do all of the hard work so you can have the fun.